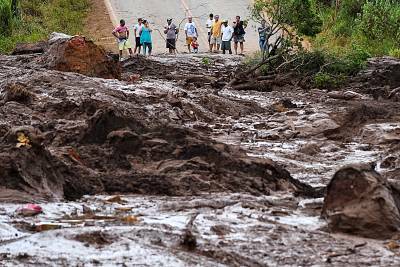 BRUMADINHO, Brazil — Brazilian officials have suspended the search for potential survivors of a dam collapse amid fears that another dam owned by the same mining company was at risk of breaking as well.Authorities on Sunday evacuated several neighborhoods in the city of Brumadinho that are within range of the B6 dam, triggered by dangerous water levels.Pedro Ahiara, spokesman for the firefighters in the state of Minas Gerais, said "the risk of a breaking continues. "Some 24,000 people were set to be evacuated to higher ground.Even before the latest news, hope that loved ones had survived a tsunami of iron ore mine waste from a dam collapse in Brazil was turning to anguish and anger over the increasing likelihood that hundreds of people had died.By Saturday night, when authorities called off rescue efforts until daybreak, the dam collapse toll stood at 40 dead with up to 300 people estimated to be missing.Throughout the day, helicopters flew low over areas buried by mud and firefighters worked to get to structures by digging. "I'm angry. There is no way I can stay calm," said Sonia Fatima da Silva, as she tried to get information about her son, who had worked at Vale mining company for 20 years. "My hope is that they be honest. I want news, even if it's bad. "Da Silva said she last spoke to her son before he went to work on Friday, when around midday a dam holding back mine waste collapsed, sending waves of mud for miles and burying much in its path.Employees of the mining complex owned and operated by Brazilian mining company Vale were eating lunch Friday afternoon when the dam gave way.Throughout Saturday, scores of families in the city of Brumadinho desperately awaited word on their loved ones as Romeu Zema, governor of Minas Gerais state, said that at this point most recovery efforts would entail pulling out bodies.The flow of waste reached the nearby community of Vila Ferteco and an occupied Vale administrative office. On Saturday, rooftops poked above an extensive field of the mud, which also cut off roads. 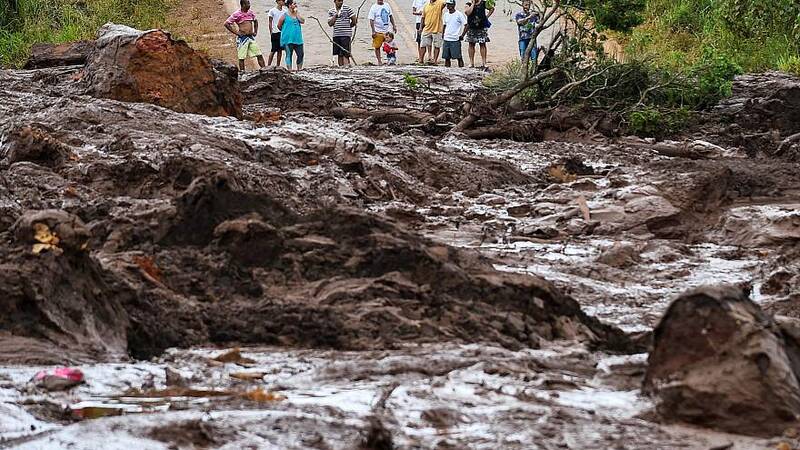 After the dam collapse, some were evacuated from Brumadinho. Other residents of the affected areas barely escaped with their lives.In addition to the 40 bodies recovered as of Saturday night, 23 people were hospitalized, said authorities with the Minas Gerais fire department. There had been some signs of hope earlier Saturday when authorities found 43 more people alive.The company said in a statement Saturday that while 100 workers were accounted for, more than 200 workers were still missing. Fire officials at one point estimated the total number at close to 300.Vale CEO Fabio Schvartsman said he did not know what caused the collapse. About 300 employees were working when it happened.The rivers of mining waste also raised fears of widespread contamination. According to Vale's website, the waste, often called tailings, is composed mostly of sand and is non-toxic. However, a U.N. report found that the waste from a similar disaster in 2015 "contained high levels of toxic heavy metals. "Over the weekend, state courts and the justice ministry in the state of Minas Gerais ordered the freezing of about $1.5 billion from Vale assets for state emergency services and told the company to present a report about how they would help victims.Brazil's Attorney General Raquel Dodge promised to investigate, saying "someone is definitely at fault." Dodge noted there are 600 mines in the state of Minas Gerais alone that are classified as being at risk of rupture.Another dam administered by Vale and Australian mining company BHP Billiton collapsed in 2015 in the city of Mariana in the same state of Minas Gerais, resulting in 19 deaths and forcing hundreds from their homes. Considered the worst environmental disaster in Brazilian history, it left 250,000 people without drinking water and killed thousands of fish. An estimated 60 million cubic meters of waste flooded rivers and eventually flowed into the Atlantic Ocean.On Twitter, President Jair Bolsonaro said his government would do everything it could to "prevent more tragedies" like Mariana and now Brumadinho.The far-right leader campaigned on promises to jump-start Brazil's economy, in part by deregulating mining and other industries.Environmental groups and activists said the latest spill underscored a lack of regulation, and many promised to fight any further deregulation.Da Silva summed up what many felt by saying the accident was clearly "negligence. ""This could have been avoided if the company had taken the necessary precautions after the tragedy of Mariana three years ago," she said.